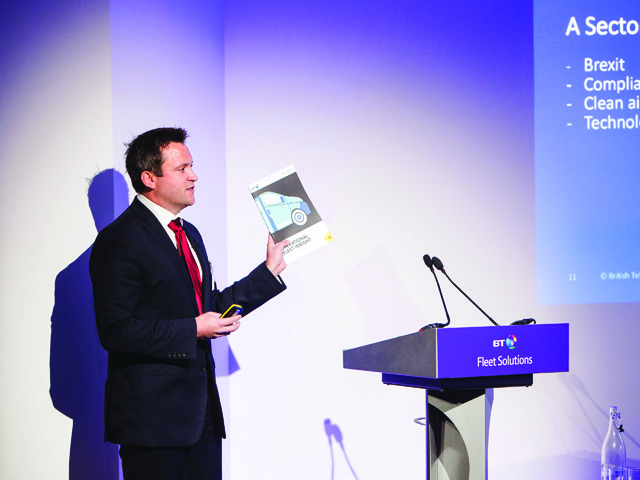 The 2017/18 Operational Fleet Insight Report from BT’s Fleet Solutions, produced with the AA, shed light on how businesses are responding to the latest fleet challenges, with the results discussed at its annual Industry Forum in London’s BT Tower. Natalie Middleton and Alex Grant look at the main findings. A third (30%) of fleets surveyed already run alternative fuel vehicles in their business and twice as many (63%) expect to within five years. But that expansion isn’t without obstacles; 82% said range and charging infrastructure is problematic, 80% cited issues with vehicle choice, and 79% wanted a larger payload capacity. Manufacturers, government and fleet providers should all be lobbying for better charging points. Only 34% of respondents said their role was entirely focused on operating a fleet, with an equal number saying it was split between this and longer-term business strategy. As such, they said it can be hard to keep on top of trends with alternative fuels, new regulations and the potential impact from Brexit. So partnerships with manufacturers and suppliers are crucial, if hard to form. Manufacturers (42%), fleet management companies (40%) and leasing partners (32%) are most common, others typically mentioned include motoring organisations (27%), industry groups (26%) and governmental organisations (18%). More than half (59%) of fleet managers surveyed said reliability was a crucial consideration when choosing vehicles – a close second to getting the best price or deal (62%). A quarter said they regularly replace vehicles to reduce downtime, and 19% reported looking at low repair costs as a way to reduce time spent off the road. The report suggests regulatory compliance is an important area where partnerships would be helpful. In its Fleet Industry Manifesto 2015, the BVRLA said the government should investigate a new intermediate driving licence sitting between the driving licence and LGV O-licence, highlighting that the skills required to drive a fully laden 3.5-tonne van are considerably more demanding than those required to drive a typical road car. Although only 37% of respondents were aware of the BVRLA’s proposal for the new licence, 49% of fleet managers said they support the idea. Two thirds (66%) of fleets said they had been impacted by Brexit, mainly due to rising fuel costs and the exchange rate, and 68% are expecting impact over the next 12 months. Most said they expect to continue with business as usual until the picture becomes clearer, and respondents added that issues affecting fleet managers won’t be a high priority for the government in the short term. Julia Saini, global vice president – automotive at Frost & Sullivan, warned that further effects could come if the UK leaves the single market. Tariffs on components could add an average £21 to annual parts costs alone, she said, with potential delays due to shortages, which would affect time-critical repairs and extend down time.